In late September, I had the much anticipated opportunity to visit several ecovillages in Portland, Oregon. Always on the short lists of greenest cities in the country, Portland is located where the Willamette River meets the Columbia. Ten thousand years ago, this location was periodically submerged under 400 feet of water, thanks to the glacial Missoula Floods. These days, people are flooding into Portland and I was on my way to stay the night at Columbia Ecovillage and next day, visit Cully Grove Garden Community and Kailash Ecovillage. I was to discover ecovillages come in all sorts of flavors. A friend connected me with a fellow at Columbia. Denny and his wife Anne had lived at Columbia Ecovillage (CEV) from the beginning, about eight years. As it turned out, Denny was a highly informative and enjoyable host. Our interests were the same—how to green our homes, but also, reach further into the neighborhood and community. We had a great time. Arriving at CEV, and veering right past a sign advising “Watch for Children,” I entered a mostly shaded parking lot. It was surrounded on all sides by 1970s-era two-story apartment buildings that contain 37 condominiums. There is ample and thoughtful landscaping, much of it edible, a number of large trees, a covered and secure bike shed with dozens of bikes and trailers inside. I saw an extensive recycling area, and chipped wood paths that connected the parking area with attractive two-story buildings where residents live. This all looked well cared for. The first residents I talked with in the parking lot were friendly and pointed me to where Denny lived. Stepping past a kid’s trike on the chip path under a chestnut tree and up the stairway, I came to Denny and Anne’s comfortably arranged three-bedroom apartment. Within minutes, I had made friends with Denny, Anne, and their two resident cats; we were soon back out the door to see Columbia Ecovillage. Columbia occupies almost four acres in an older neighborhood. It has a condominium ownership model. The founders bought an old farm house behind the apartment complex in 2004 and were later able to buy the apartment complex with the intention of creating a cohousing community. They took on the liability of a sizable upfront investment. Once the word was out about the new project, it did not take long to attract interested persons to buy in. Eight years later, Columbia looks to be thriving. Denny showed me around. The place has many attributes common to cohousing such as shared laundry, arts and crafts space, kid space, and common house. We ran into several other members out near the entrance. A comment was, “It takes 15 minutes to walk across the parking lot.” Not because it’s such a big parking lot; rather, you always run into people you need to talk with. The outback open space was maybe half the land area of CEV, which included extensive bamboo plantings and huge black walnut trees. The veggie gardens were personal plots and the cooperative fig grove featured seven different kinds of figs. The chickens looked happy. A cluster of multi-thousand-gallon rainwater storage tanks clearly showed the group was serious about water storage. A number of well maintained older outbuildings date back to the farm days. One they call the speak-easy, where members and friends gather to play music, make noise, and have fun. The most distant ecovillage boundary provided views of neighboring properties. I saw gardens and creative-looking outbuildings on the large lots where others seemed to have similar ideas to Columbia. Denny affirmed that many of the neighbors were on good terms with CEV. Participation is a core value at Columbia. There are frequent shared meals, informal get-togethers, work parties, and committees. Members are required to participate at least nine hours a month in community projects, while some people take on many extra tasks as their time and interests allow. There are pod work groups for chickens, rainwater system, bookkeeping, yoga, public relations, maintenance, special events, hosting visitors, managing the Common Hall, and more. Columbia is governed as a self-managed condominium. Work and decision making take place in four self-organizing domains: administration, facilities/maintenance, land use, and social life. Overall, Columbia looked great. Most of the members I met were Baby Boomers. Their collective values were all good; protect nature, conserve resources, respect each other, egalitarian management, and balance group needs with self. Denny was a wonderful host to show and tell about the ecovillage. He also knew a great deal about what was happening in the nearby neighborhood. That was next on the agenda. We passed by front yard gardens here and there on the leafy streets of Cully Neighborhood. We visited a half acre property that included an eco-minded preschool, a Gypsy-looking tiny house, and quarter acre flower farm. Denny kept up a running commentary of anecdotal greening-the-neighborhood stories the whole time. I was already impressed with everything when we came upon a cluster of five homes with both practical and amusing features. There were front yard gardens, a co-op house that hosted community happenings, a Bathtub Museum, vernacular public art, and a streetside reclamation spot for neighbors to repatriate small items stolen by a four-footed cat burglar. 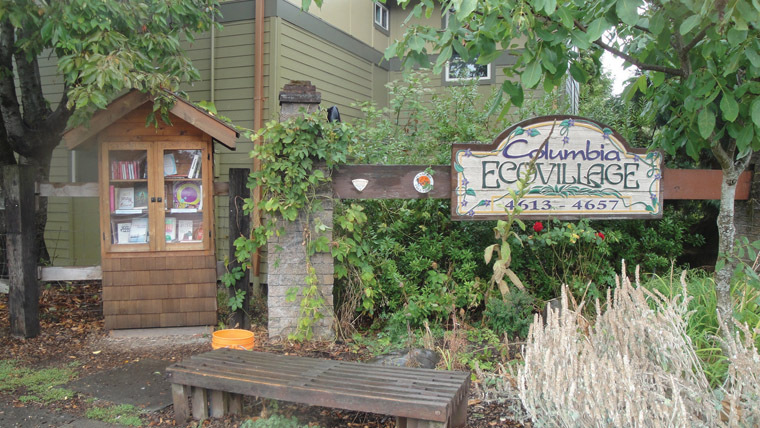 I asked Denny if Columbia Ecovillage may have had a hand in greening the neighborhood. Modest as he was, he told me the neighborhood already had a history of eco-friendly culture that predates Columbia, but he also said Columbia has certainly had some positive influence and adds significantly to that culture. Like my suburban property in Eugene, an ecovillage such as Columbia is great but, again, the scale needs to go far beyond several dozen exceptional households in a neighborhood with thousands that are not so forward-thinking. Denny told me about a small nonprofit, Our 42nd Avenue, helping to green the neighborhood. I was about to see a small but very significant tool, and projects it is facilitating, with enormous potential for transforming economy and culture. 42nd Avenue in Cully Neighborhood, just south of Killingsworth, is ground zero for small-scale eco-minded economic renewal. It’s a several-block commercial area, four or five blocks from CEV, with several empty or underused commercial buildings, although the zone already can boast of several vibrant stores and cafes. Economics is the dominant force that has shaped empires, started wars, fabricated culture, determined haves and have-nots all through history; from the Phoenicians, to Marxism, to the Chicago School, right up to the present. Just about all the escalating social, political, environmental misadventures of our time are a product of global market capitalism. From my perspective, creating green, uplifted, and healthy alternatives to market capitalism is the most urgent task of our time. What would a society look like where the economic system’s task was to serve the public good rather than monetize, exploit, and degrade it? Our 42nd Avenue is the choreographer of a set of modest actions—a model that could be upsized as much as people involved want to take it. Denny took me to the last farmers’ market of the season in the midst of the 42nd Avenue redevelopment zone. There were farmers and craftspeople from the nearby neighborhood. A person from Our 42nd Avenue was tabling to explain the group’s work. I saw lots of mixing and mingling, buying and selling. The market was eco-friendly, festive, a coming together at the neighborhood scale. I met several of the farmers, had a beer, and chatted with a lot of people. Afterwards, Denny showed me some of the small farms in the nearby neighborhood and they were beautiful. People were building businesses with specialty crops and value-added food-related activities. One property was owned by supportive neighbors, another made available by a community-minded church. One fellow at the market had a startup across the street, incubated by Our 42nd Avenue. His budding new business, still very small, is an urban farm and garden store, to sell products and provide services to both home gardeners and larger urban farms. Perfect! Up the street was a sizable empty commercial space. Our 42nd Avenue was in discussions with the property owners, local businesses, and interested community members to make creative new use of that space that would be true to the ideals of Our 42nd Avenue and the neighborhood. This brief exposure to a small urban area caused me to imagine. I had seen small but important elements of a more green and local economy. Certainly this part of the neighborhood is not going off the mainstream grid, but if there is to be a greening of the neighborhood culture and economy that moves in a mindful direction, this could be what it might look like in the early going. Everything that I saw can grow, inspire nearby commercial zones to do likewise, form clusters, and expand much more widely into the community. My own awareness of ecovillages and intentional communities started 45 years ago in north central Texas, of all places. Whitehawk was an intentional community north of Denton, Texas, where I went to college. Several friends lived there, out north of town past the shuttered and bunkered Nike missile base. In the mid ’70s, it was off the grid; the 12 or 15 homes were all earth-sheltered ferrocement burrowed into the south-facing slopes of the prairie landscape. Most had exposed glass walls facing the south. Except for the windmills, the place looked a bit like a moon base. About the same time in the late ’70s, I became involved with a back-to-the-land community in the Arkansas Ozarks named Sassafras. We were off the grid and three miles from a paved road. Steep Cave Mountain Road up to our place blew out more than one radiator. Our neighbor’s kids would nail dead birds on the gate we had to open to cross his property to access ours. We grew a considerable amount of our own food in this gorgeous and rugged Ozark valley that ranged in elevation from 1200 feet above sea level down at Beech Creek to over 2300 feet at the cliff above, only a quarter mile away. You could drink the water in the creek. You could get lost in the caves on the property. A favorite pastime was working things out with each other. We were all OK. We had community projects, frequent sweat lodges, workdays, and an outdoor kitchen, complete with resident rattlesnake under the woodbox. The place was on the commune circuit with many visitors in the summer. The community’s unique coming-to-an-end is a favorite counterculture story in the northwest Arkansas Ozarks. In the mid ’80s, I spent a month as a volunteer on a nonreligious kibbutz in Israel. My final few miles of travel arriving to the kibbutz was in an armored personnel carrier. The place was near Nazareth and was home to about 500 people. On a rocky hilltop, Kfar Hahoresh was a planned community with a large central recreation space surrounded by nice landscaping, residential and service buildings, all very modern. Kids grew up together, not with their parents. Most of the older ones couldn’t wait to leave. There was a primary school and basic health care on site. Almost everyone worked at the Kibbutz. An important community business was a large automated kosher bread factory. When I had a choice of jobs, I always went to the avocado orchards down in the valley. A majority of the residents were from eastern Europe, emigrating in the mid 1930s when Fascism was on the rise. There were few if any private cars. I can appreciate the site design, social and economic aspects far more now than when I was there, 35 years ago. I spent two early springtime weeks on a foggy, chilly, and rocky hilltop in south Italy with a group of radical pacifist Catholics. They were into extreme voluntary simplicity. It was cold, no electricity, no machines. Core to their beliefs was that any involvement with the mainstream economy was complicity in damage that economy did to people and planet. The common denominator of all these places was some kind of disaffection for the mainstream culture and economy and what it did to people and the environment. These visits and the passage of time give me more of an appreciation for the ideals of living more green, modestly, and cooperatively. After leaving Columbia Ecovillage, I shifted only a quarter mile, still in Cully Neighborhood, to another ecovillage called Cully Grove. While Columbia and Kailash, which we will have a look at shortly, made use of existing built infrastructure, Cully Grove is an infill project on an undeveloped two acres. Instead of a conventional subdivision of 16 detached homes, the plan for Cully Grove was to build relatively modest eco-friendly homes, to preserve open space with heritage trees, and design for social interaction and cooperation among the residents. The results are beautiful. There is a shared garden area, shared bike shed, community house, and shared workshop space. Interestingly, if you don’t have a car, you don’t pay for parking. The homes are insulated above code, and appliances are more energy-efficient than they have to be. Which brings us to cost. These are full-size, 1500-square-foot homes and nicely appointed. Cully Grove is a more upscale project than Columbia, and even more so compared to Kailash. Cully Grove is a beautiful place and quite possibly, some homeowners could afford more than this. It makes me wonder: how do people with both money and concerns about eco and social footprints reconcile the two? I left Cully Grove and drove five miles south to Kailash Ecovillage with a high level of anticipation. I already knew a good deal about Kailash thanks to its very informative website and was not disappointed. Ole and Maitri Ersson bought a run-down apartment complex in SE Portland in 2007 with a loan from a progressive local bank. At the time, the complex was notorious in the neighborhood. It was like the Wild West for drug dealing with occasional shootouts in the parking lot. Many of the 32 one-bedroom apartments were not fit to live in. That all changed with the new sheriff and deputy. Today, Kailash (KEV) strikes me as a grand slam home run of socially and ecologically thoughtful urban renewal. Perhaps the most impressive features of Kailash are how the down-and-out infrastructure has been repaired and repurposed; also the long list of social and outdoor amenities for the 60 or so residents; and finally, how living at KEV is accessible to people of modest means. A lot has been accomplished since 2007. Kailash is surrounded on three sides by newer two-story apartments. To the east, one finds brick, ’40s-era suburban-bungalow-type houses on sloping streets with many trees. It’s a nice-looking neighborhood. KEV is a great example of the benefits of open space as a function of residential density. In land use planning, greater residential density can also translate into more open space. About half of Kailash is residential and parking; the other half is garden, orchard, and open space. Early on, 16 parking places and several smaller concrete areas were depaved and turned into garden, a great example of reclaiming automobile space in favor of productive use. In 2010, the acre next door, covered with blackberry jungle, was purchased to complete the current two-acre size of KEV. The outdoor part of Kailash includes 46 individual garden plots and shared garden projects. There are 53 fruit trees, a small vineyard, blueberries, cane fruit, and a large bamboo patch that screens the perimeter, making for a nice green enclosure. There is also a cooperative tool shed and small intimate contemplative area with a wet weather brook, hammock, and sitting area. Also outside is a large compost area and shared covered bike area. There is a greenhouse and space for small individual and creative outdoor projects. The KEV website has extensive documentation of all these features. The apartment building has seen upgrades since its Wild West days. In addition to the one-bedroom apartments are many amenities such as an 1100-square-foot community room, community kitchen for events, games collection, big screen TV with surround sound, internet station, and more. Kailash has hosted meetings from outside the ecovillage along with in-house parties, discussions, and gatherings. There is also a laundry room and the mail room has member bios at each mail box so people can become better acquainted. This may sound like an infomercial but it serves to show the detail of planning for making life at Kailash a positive experience for all involved. Participation is essential for keeping all this going. There are teams to take care of the bike area, library, compost and recycling, fruit trees, garden, and indoor amenities. A car share project is in the works. Members are asked to commit a minimum amount of time to the community. KEV also reaches out to the wider neighborhood. There are several garden plots used by people in the neighborhood. Wood chips delivered are made available to anyone in the neighborhood. There is a community bulletin board down by the street. Kailash actively networks with other ecovillage and cooperative living groups in Portland. Kailash has a ham radio for disaster use while several members are active in the neighborhood association and city emergency response program. The scale of Kailash gives it the capacity to reach out like this in so many different ways. Members’ rent is similar to the surrounding neighborhood. That means people of average means can afford this very unusual ecovillage lifestyle. I can see residents here as students in a sort of school for ecological and cooperative lifestyles where they can experience alternatives to mainstream economy and culture. The “graduates” are likely to apply their “degrees” at KEV to positive effect in the wider world. A grand slam. That’s a good way to describe Kailash Ecovillage. I honestly could not imagine a more complete repurposing of a two-acre patch of urban infrastructure and space. You can find much more detail and photos at the Kailash website, www.kailashecovillage.org. The three ecovillages I visited all have a keen interest in reducing their members’ ecological footprints while building social cohesion. They all make use of existing urban land use opportunities. Each one started with an ambitious idea that resonated enough that others wanted to be involved. There has never been a time in human history where reducing our eco footprints and building social cohesion have been more important. These qualities are vital requisites of perhaps modern humanity’s greatest adventure, fitting into the natural world. One can find allies, assets, and opportunities for this historic adventure just about anywhere. All over the country, a growing number of people are not only concluding the current mainstream economy and culture are not appropriate, but they are taking initiative to pioneer alternatives. Initiative comes in many forms, such as changes to one’s own home and property as in Cully Neighborhood. One property making mindful changes often leads to a nearby neighbor or two or three doing something similar, like the five front yard garden cluster near the Bathtub Art Museum. Cully’s emerging clusters, ecovillages, neighborhood farms, and Our 42nd Avenue support each other and all help move these ideas further into the neighborhood and beyond. And they have company. Progress is a single front yard garden in Beaumont, Texas, the only one locals have ever seen, that starts to cause a buzz in the neighborhood. Elsewhere, someone might buy the property next door, taking the fences down, and that sets off a chain reaction and a few years later, all the back yard fences are gone and a shared identity emerges between a dozen houses. That’s what happened at N Street Coop in Davis, California. A group of neighbors might start to coalesce because of a shared geographic characteristic like Enright Ridge in Cincinnati. East Blair in Eugene, Oregon is a legal nonprofit that owns 11 residential properties, and they are managed in a mindful way that benefits the members, the environment, and the neighborhood. These and other examples of organic transition towards economic and cultural transformation are the previews of a more green and peaceful future. River Road Neighborhood, three miles northwest of downtown Eugene, Oregon has a small but significant and growing identity as a place with an appreciable number of people interested in permaculture and paradigm shift. There have been dozens of permaculture site tours over the past 10 years to show and tell the growing number of properties in the neighborhood that are trading grass for garden, creating edible landscapes, catching rainwater, depaving, building with natural materials, making use of passive solar design, and constructing small accessory dwellings. River Road hosted the 2015 Northwest Permaculture Convergence at the neighborhood recreation center, in the middle of this suburban neighborhood. Many of the event coordinator positions were taken by residents in the neighborhood. The neighborhood association played a big part in putting on the convergence. Part of the event was free and open to the community. Over 700 people from the neighborhood, Eugene, and beyond attended the event. We have had other permaculture events, classes, and work parties. A 65-tree filbert grove on public property along the Willamette River has been restored in cooperation with the city. Several like-minded property owners have taken down back yard fences. A small but growing number of people are buying properties in the neighborhood because they know there is a small but growing momentum for creating a more green and resilient neighborhood. A new opportunity has presented itself that can be an important catalyst for greening our neighborhood. The city of Eugene is putting a substantial amount of staff time and resources into a high profile neighborhood visioning process that is intended to help guide our neighborhood into the future. The entire series of meetings, discussions, and input will take over a year. Public participation is an essential part of the effort, with the city sending out lots of mail to neighborhood residents explaining the importance of the visioning process and urging them to participate. To insure alternative perspectives in the neighborhood are part of the process, the River Road Green and Resilient Caucus has formed. The Caucus asserts the mainstream economic system and the consumer culture it has created are the cause of a wide range of well documented social and environmental problems such as climate change; social, economic, and political disequity; damage to public health; resource issues; and much more. Further, the Caucus states that to plan a future for the neighborhood based on the same land use, transportation, and development assumptions and policies that have already caused so much damage to public health and the environment is continuing to live in a highly flawed past, not a vision for a green and resilient future. Three members of the Caucus are also board members of the neighborhood association, while overall, the neighborhood association board is sympathetic. The first public meeting attracted well over 300 people sitting at round tables in discussion groups of eight to 10 people. The Caucus contributed an impressive display of posters, photos, and explanations along a wall, describing suburban permaculture, front yard gardens, green neighborhoods, and ecological approaches to economy and culture. Over 50 posters about green and resilient living were given away while dozens of people browsed the display. Many discussion groups included permaculture-minded neighbors who added green and resilient content to the conversations and written comments. The Caucus is also writing a “Green Paper” that will inform the visioning process with more detail about greening the neighborhood; it will go out to the neighborhood and become part of the public record. We are using this rare opportunity of public process to put green, resilient, and permaculture ideas out to the wider community. There are tens of thousands of neighborhoods all over the country with green and resilient potential. They all have assets, allies, and opportunities already there to work with. They just need to be called on. Small projects can inspire larger projects which can lead to clusters. Clusters can grow into ecovillages, eco-neighborhoods, and eco-communities. The more, the sooner, the better. Jan Spencer lives in Eugene, Oregon. He has traveled for over five years out of the country, all over Europe, east, central, and south Africa, New Zealand, Israel, and Central America. Jan has been transforming his quarter-acre suburban property for 17 years. His interests are a fusion of permaculture, urban land use, economics, neighborhoods, and social uplift. Jan has been on the board of his neighborhood association for over 10 years. He has made presentations on the East and West Coasts and in between, written blogs for Mother Earth News, and is available to present to colleges and conferences both in person and via internet. His website is www.suburbanpermaculture.org; contact him at janrspencer [AT] gmail.com. ← Reminder: Big Book Sale this January!